This is definitely a rum to chillax with. A solid, relaxed and very pleasant Salvadorean rum which should be given some attention…even if it’s actually from Panama. Assume you were a new outfit in a country A and were making a new rum whose brand was once owned and which was once made, by your family; you sourced distillate from another country, B; used that country B’s facilities to make and age the finished product; and hired a Master Blender, also from that B country. Now, the question is, whose rum is it? A or B? This is not nearly as academic an exercise as it seems, because Ron Maya purports to be a rum from El Salvador, yet the sugar cane and distillate hail from Panama, the rum is aged in Panama, and the ‘recipe’ for the final blend comes courtesy of Don Pancho Fernandez, also associated with the Panamanian industry. 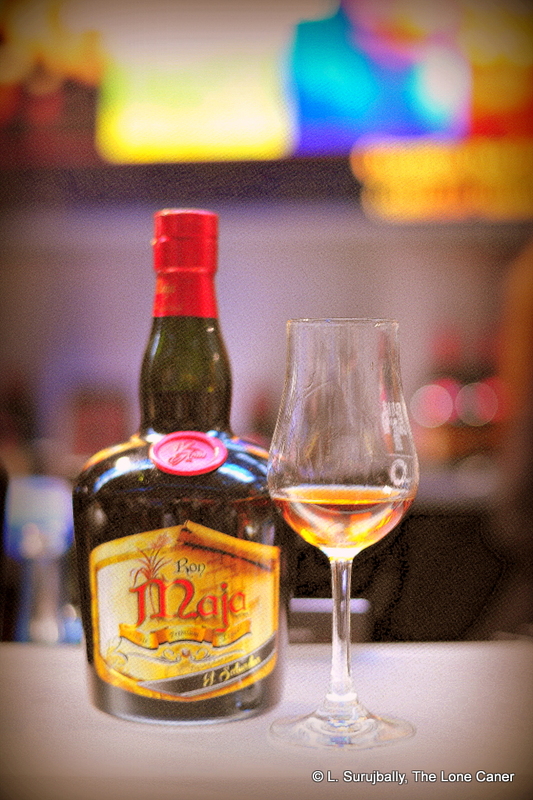 When I ran across the rum at the Berlin 2014 Rum Festival (where it won a Bronze medal for 11-14 year old rums), the company representative was quite clear about the matter without any prompting. She told me frankly that the purpose of making both this product and its younger 8-year old sibling (also an award winner in Madrid in 2014), was to kickstart a long-dormant rum industry in El Salvador generally, and for the family that owned the brand specifically. The issue is not entirely without precedent – for example, Pyrat’s no longer has much, if anything, to do with Anguilla, St Nicholas Abbey sourced its original stocks from FourSquare, and many Caribbean Islands’ companies buy molasses from Guyana…and you sure never see that anywhere on various labels. (My opinion is below). That out of the way, what are we to make of the twelve year old rum aged in ex-bourbon barrels, and issued at a soothing unaggressive 40%? It was housed in a squat green bottle, decent plastic tipped cork, and marked with a bare minimum of information on the label – including that “El Salvador” moniker – and poured out in a bright golden liquid. It smelled like what it was, a soft, easy-going, medium-bodied rum, with vanillas, some brown sugar and coconut politely jostling for my attention. There was no aggressiveness at all here, and my initial opinion was that it was a good all-rounder: it could just as easily be a mixer, had neat, or over ice for those who preferred it that way. Still, given its rather gentle aroma, I’m not sure how much any mix would add to its value…a cola or ginger beer might just shred the thing. Things got rather more assertive as I tasted it (and I went back to it twice that day when no-one was looking just to confirm my initial impressions) – the lightness of the nose gave way to a taste that was more solid. Soft fleshy fruits, vanilla, a flirt of citrus were in evidence, followed by peaches and ripe apples and smoke. And again that hint of lemon zest and perhaps even a bit of ginger, for a fillip of complexity. It was very Panamanian, or Latin if you wish – there were aspects of it that reminded me of similarly serene Peruvian and Colombian rums I’ve had, and could be confused with an Abuelo 12 (which was heavier), Juan Santos 12 (a shade lighter), or even Rum Nation’s 18 year old (a bit more complex). The finish was smooth, warm and quite docile, providing pleasant reminders of what had gone before it. Maja is trying to jump start an indigenous rum industry, and have created a very good rum from stocks which have all been aged twelve years (it’s not a blend of various ages). To do this properly, what they have to do is grab some market share from more established companies, and hew to the standard proof line. My own feelings on 40% are not new: still, putting aside such a personal predilection, I believe that the Ron Maja 12 year old is a solid mid-tier rum whose great strength will be its overall delectability and versatility, if not true passion (it’s really not the kind of rum that inspires solo trans-Atlantic voyages in a bathtub, for example, or grandly-declaimed love from the rooftops by misguided lovelorn swains). It’s simply good, and what it brings to the table is accessibility (many will really enjoy its laid-back profile), overall quality, and lack of in-your-face bite. It’s a well-made, smooth and warm drink, with enough going on within that you’ll never doubt that it still remembers it’s a rum. And at 40% and €45 per bottle, you really won’t have a problem drinking it neat, which for me is a pretty good recommendation. The Rumporter online magazine has a small article on this rum here, in French. I have an outstanding email in play to Ron Maja, where they promised to get back on to me regarding more history and background; when received, I’ll update this post. While appreciating the logistics and other problems Maja no doubt has undergone in bringing its product to market, I am going on record as disapproving of the labeling exercise – it ignores the reality of what this rum really is, and touches on larger issues of truth in advertising and presentation. The founding family and originator of Ron Maja is from El Salvador – is this enough to make it a Salvadorean rum when everything that comprises it except the owners, is from somewhere else? For this to be presented as being what it supposedly is, I believe that some part of the production process has to be in El Salvador (like the Islands mentioned above have ageing and blending facilities in their territories, or St Nick’s is aged and bottled at the Abbey). The cane, the molasses, the distillation or the bottling…something. This may just be a fig leaf to add that touch of respectability or verisimilitude, but it would give consumers a better idea of what it is they are getting for their money. Update March 2015 – According to the company, the recipe used to assemble the rum was developed by the family, and this is the source of stating it is Salvadorean.